The technology involved in the silent continuous focusing for video and the excellent built in stabilisation were very impressive. As such its a decent kit lens for the GH2. It takes good images and while at no time approaching the quality of lenses like the 20mm f1.7 it performs better for stills than the 14-42mm. The problem with it is its value in low light situations, because of its modest f4-5.8 aperture. It does struggle indoors in low light, and since its a lens optimised for video this does rather make it less useful than it should be. f5.8 at 140mm at a maximum of ISO 1600 on the GH1 meant that when we used it, we often ended up with some pretty murky footage, and we would often switch to the 20mm f1.7 or another fast lens. The GH2 gives an extra stop, allowing video up to ISO 3200, but even this is often not fast enough. Shooting some video on it with the 1 to 1 video crop mode - EX. TELE. CONV. - it turned into an amazing telephoto - the equivalent of a 700mm in 35mm / full frame terms, but needed a very stable tripod to get good results. To use it like this the continous AF needed to be turned off as the focus hunting is greatly exaggerated. Trying it with the AF on produced unusable results when I tried it. As I suspected this lens is more useful for video than stills. It has the same silent focusing as the 14-140mm and in that respect provides a cheaper, lighter and smaller alternative to the larger zoom. Results for video were pretty good where its shortcomings wide open are less obvious. With the 1 to 1 video crop mode - EX. TELE. CONV. - its capable of quite a long reach. Both of these Olympus zooms are also optimised for video, with silent focusing and continuous AF on the GH2, though I found that the 14-150mm occasionally struggled to focus in low light. So if you want to use these Olympus lenses on the GH2 for video you don't have to get the 14-140mm zoom. 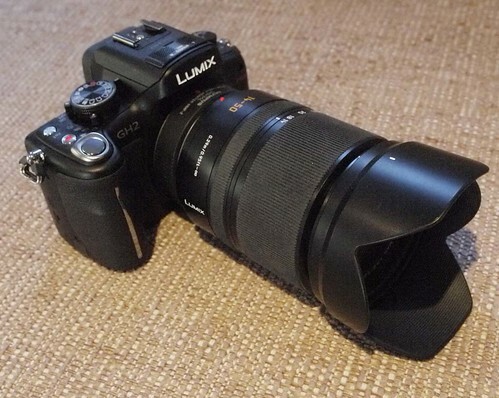 In many ways the fact that there are now alternatives to the Lumix 14-140mm makes it less the "must have" kit lens than it was with the GH1. Personally I prefer the Olympus 14-150mm for stills. Its lighter and smaller and I think its a sharper lens than the Panasonic, though there's not much in that. If I'm going to do some follow focus work I'll use the 14-42mm since I'm not going to be trying that with the long end of the 14-140mm and hope to get any decent footage. Thinking about the uses of video on the GH2, and in the light of some questions I've been asked via email, there are some things to be borne in mind. Just how useful video and the video optimised lenses on the GH2 are, is entirely dependent on what you want video for. 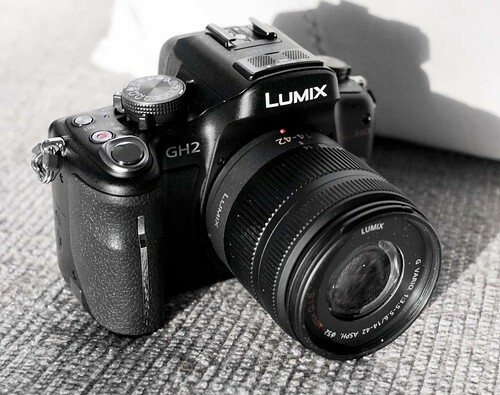 If you want to use it to produce some decent quality HD video, for yourself or even commercial use, then the GH2 is a great tool. If you are prepared to take your time, use manual focus, prepare well and have a sturdy tripod then its capable of stunning results. If however you want to use it mainly hand held to record family and holiday events in different lighting situations then it may be less useful. The continuous auto focusing feature sounds a great idea but in reality is less so. The constant focus hunting often makes for unwatchable footage. If you're trying to record your childs first steps, "take 2" isn't an option. The "problem" is with the larger sensor. Even the m4/3 sensor is less forgiving in terms of depth of field than the sensors found in compact cameras and video camcorders. On these cameras continuous AF is far less noticeable because most things are in focus most of the time. As such I think they are a better bet for general domestic video use than the GH2 or any of the DSLR or Mirrorless larger sensor cameras. This is not to say that something like a GH2 can't be used for these purposes. Its just that it needs more care and more thought. Personally I (we) very rarely use the continuous AF, preferring manual focus most of the time. I (we) rarely use slow zooms indoors. I (we) rarely work hand-held, though the Sony A55 is offering possibilities in that area. Most discussions about video-enabled stills cameras seem to centre around "pro features" like frame rates, HDMI, rolling shutter etc. and less on the usability of these cameras. Most people don't really care about whether their camera shoots at 30 or 25 frames per second, they just want some decent looking footage without having to employ a film crew! To that end cameras like the GH2 may not be the complete solution. There is a concern that the manufacturers of cameras like the GH2 or indeed the NEX series, the Olympus PEN's and the Samsung NX series, don't really know who they are for. At the moment it seems to be a "lets cover all bases" strategy. Everybody from a compact camera upgrader to a professional filmmaker seems to be the current target market, which is all well and good, but can sometimes result in confusion for a relative beginner. The GH2 is obviously positioned at the top end of this market, with the quality and versatility to tempt any photographer at any level, but it does require an exploration of its possibilities to realise its potential. It can be used as a point and shoot, and it has its share of "micky-mouse" features, but there are simpler and cheaper alternatives if thats what you want. That features like "Intelligent Auto" are included at all shows the ambivalence of Panasonics attitude. This is very clear with the GH2's video capabilities. These are immense and provide terrific possibilities, however I want to make the point that these very possibilities can make the idea of using it as a simple movie making machine for life recording more difficult than it looks. 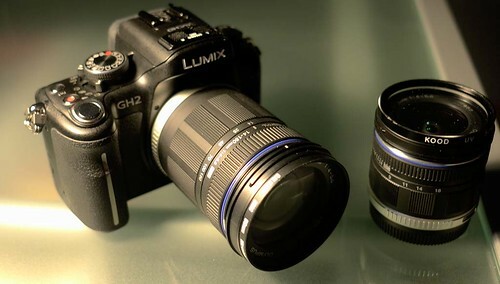 Panasonic DO have a brilliant kit zoom lens for the GH2. Unfortunately its not in a m4/3 mount. It has lighting fast AF, a useful zoom range, built in image stabilisation and the image quality of a selection of prime lenses. Its the Leica Panasonic 14-50mm D f3.5-5.6 which was the kit lens on the Panasonic L10 4/3 DSLR. I tried it on the GH2 yesterday and the AF is lighting quick. Being the last (and least regarded) of the Panasonic D series lenses to be made and designed its the most compatible with the Panasonic G series m4/3 cameras. Image quality is superb. Its possibly even better than the 14-150mm Vario-Elmar. Its absolutely brilliant for stills and video and being somewhat overlooked can be picked up at very reasonable prices either new or secondhand, though if you haven't got a 4/3 > m4/3 adapter you need to buy one of those as well. Its bigger and heavier than the 14-45mm and 14-42mm kit zooms but not by much, however in terms of optical quality its in another league to those lenses. Its the last lens I'm going to testing with the GH2 before doing a conclusion and after that a comparison piece on the GH2 and Sony A55.